Ruth came to National Star (then The Star Centre) in 1969 as a 16–year–old. She was one of 40 residential students. Ruth was already used to living away from home and had done so since the age of two. When she finished her two years at college in 1971 Ruth didn’t want to move back home. She wanted to be independent but the closest suitable accommodation available at that time was in Swansea. Ruth later returned to Somerset and moved into purpose–built accommodation in Taunton. Ruth finally secured her own home in the late 1980s. She still lives in the same bungalow in Somerset, maintains her independence and has a wide circle of friends. National Star records from 1969 show that the range of disabilities of students included cerebral palsy, spina bifida, severe asthma, brain injury, ‘slow developer’ and polio. Equipment used included calipers, Invacars (one person small vehicle for use by drivers with disabilities), manual wheelchairs, walking frames, hearing aids and tricycles. Ruth, who has cerebral palsy, arrived at The Star Centre with her ‘rollator’ (wheeled walking frame) and a manual wheelchair. In 1969 The Star Centre was entirely based in the Manor building and a nearby stable block which was converted into an occupational therapy workshop. Ruth’s room was on the first floor of the Manor and she shared it with three other girls. The downstairs rooms included a dining hall, a typing room and a common room where students spent much of their leisure time. The fire escape was a covered fibre glass slide accessed from the first floor and which Ruth used during a fire alarm. As well as taking her classes, Ruth, like her fellow students, had physiotherapy, occupational therapy and speech therapy. At the time, physiotherapy treatment came mainly in the form of sport such as hiking, weight lifting, riding and swimming. 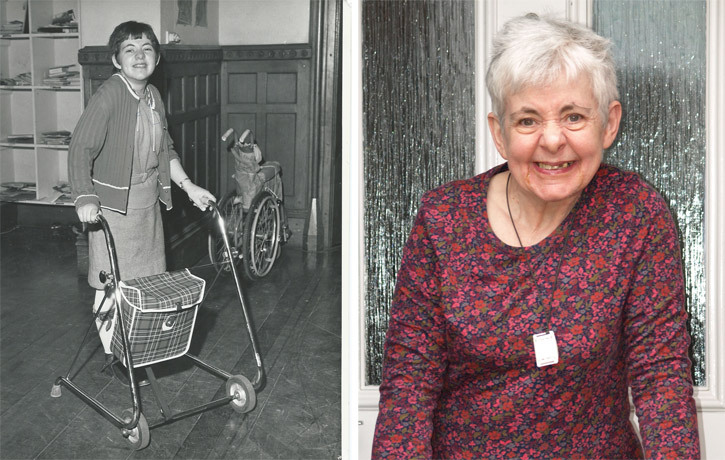 Ruth’s physiotherapy reports mention her being fitted with calipers and walking unaided.